There is never enough time in the day. Many of us have very busy and hectic schedules. Work, personal life, family responsibilities and the need to get in daily exercise; it can all be too much. Something has to give and unfortunately it is often exercise. Soon enough we all have a few extra pounds in the middle, look horrible in our bathing suits and possibly even have a tougher time at work because of the extra pounds. Fortunately there are many methods to exercise in conjunction with time spent at the office and other responsibilities. One of the great ways to do this is with a set of solid body dumbbells. These dumbbells are sleek and multipurpose, they can be used while jogging, walking, physical therapy and even in yoga. One thing they do not tell you about is that there are often great for office workouts. 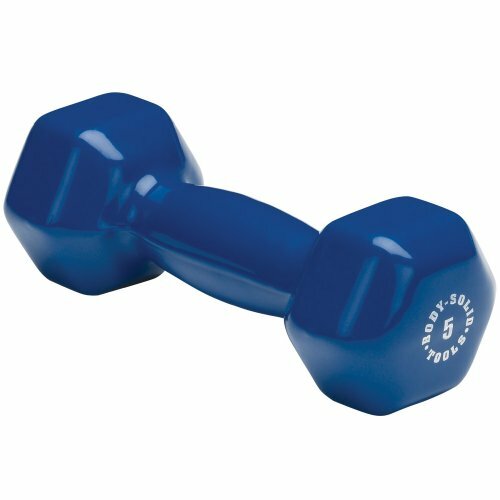 These vinyl coated dumbbells are easily stored in a desk drawer for easy access. When you have to read a report or go over other mundane work on your computer it only takes a moment t o take these weights out and use them. These sleek, vinyl coated weights, are excellent for doing repetitive long muscle exercises like curls, presses and lifts. Since the weight is so small it is easy to do the exercises without thinking as a form of multitasking. You may wonder at the small amount of weight. I know when I go to the gym, I use more than 5 pound weights, at very least breaking out the eight, ten or fifteen pound models. But the point of these light weights are not for the weight, but for the repetitions. A set of 10 to 15 curls with the solid body 5 pound dumbbell will not be a great exercise for you. Go to small amount of weight you can easily do sets of 300-400 while not even paying attention. That will give your body a decent workout. Heck, I use a voice dictation a lot of time in my work, I can get in reps of thousands while getting my work done with this light weight. If you're looking for a great exercise for your office, or an exercise that is done quickly and easily spare time you cannot go wrong with trying to get a few sets of lightweight dumbbells. It is simply a matter of making it a habit to get in a few quick reps at your desk between assignments, or when taking a quick 5 minute break. Once you train yourself to use them throughout the day on a routine basis, you will find your energy and strength increasing. These dumbbells come in different sizes from very light 2-3 pound neoprene weight versions to slightly heavier 10 pound versions that are still good for heavy repetition exercises in the office will still getting your work done. Dumbbells will not make you get out and get the exercise you need, but having a nice set handy can help for Yoga, Pilates, or even jogging/walking with weights. These handy little weights can come in quite handy as a supplement for your workout routine. Solid Body Dumbell 5 lb.